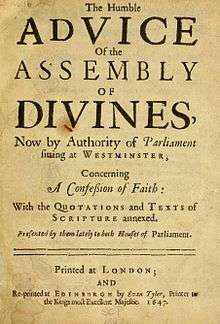 The Westminster Assembly of Divines was a council of theologians (or "divines") and members of the English Parliament appointed to restructure the Church of England which met from 1643 to 1653. Several Scots also attended, and the Assembly's work was adopted by the Church of Scotland. As many as 121 ministers were called to the Assembly, with nineteen others added later to replace those who did not attend or could no longer attend. It produced a new Form of Church Government, a Confession of Faith or statement of belief, two catechisms or manuals for religious instruction (Shorter and Larger), and a liturgical manual, the Directory for Public Worship, for the Churches of England and Scotland. The Confession and catechisms were adopted as doctrinal standards in the Church of Scotland and other Presbyterian churches, where they remain normative. Amended versions of the Confession were also adopted in Congregational and Baptist churches in England and New England in the seventeenth and eighteenth centuries. The Confession became influential throughout the English-speaking world, but especially in American Protestant theology. The Assembly was called by the Long Parliament before and during the beginning of the First English Civil War. The Long Parliament was influenced by Puritanism, a religious movement which sought to further reform the church. They were opposed to the religious policies of King Charles I and William Laud, Archbishop of Canterbury. As part of a military alliance with Scotland, Parliament agreed that the outcome of the Assembly would bring the English Church into closer conformity with the Church of Scotland. 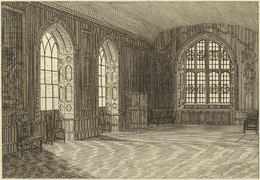 The Scottish Church was governed by a system of elected assemblies of elders called presbyterianism, rather than rule by bishops, called episcopalianism, which was used in the English church. Scottish commissioners attended and advised the Assembly as part of the agreement. Disagreements over church government caused open division in the Assembly, despite attempts to maintain unity. The party of divines who favoured presbyterianism was in the majority, but political and military realities led to greater influence for the congregationalist party. Congregationalists favoured autonomy for individual congregations rather than the subjection of congregations to regional and national assemblies entailed in presbyterianism. 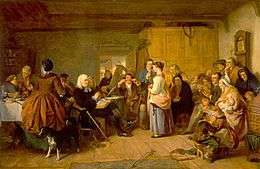 Parliament eventually adopted a presbyterian form of government, but it lacked the power the presbyterian divines desired. During the Restoration of the monarchy in 1660, all of the documents of the Assembly were repudiated and episcopal church government was reinstated in England. 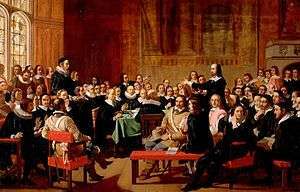 The Assembly worked in the Reformed Protestant theological tradition, also known as Calvinism. It took the Bible as the authoritative word of God, from which all theological reflection must be based. The divines were committed to the Reformed doctrine of predestination—that God chooses certain men to be saved and enjoy eternal life rather than eternal punishment. There was some disagreement at the Assembly over the doctrine of particular redemption—that Christ died only for those chosen for salvation. The Assembly also held to Reformed covenant theology, a framework for interpreting the Bible. The Assembly's Confession is the first of the Reformed confessions to teach a doctrine called the covenant of works, which teaches that before the fall of man, God promised eternal life to Adam on condition that he perfectly obeyed God. There were also conflicts between the king and the Scots, whose church was ruled by a system of elected assemblies called presbyterianism. James, Charles's predecessor as King of Scotland, made it clear that he intended to impose elements of episcopal church government and the Book of Common Prayer on the Scots beginning in 1604. The Scots considered this a reversion to Roman Catholicism. 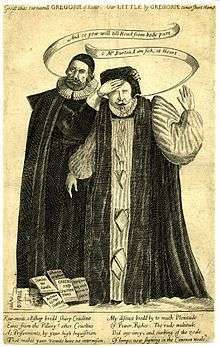 Charles furthered English impositions on the Church of Scotland in 1636 and 1637. This led to the First Bishops' War between Charles and the Scots in 1639. Charles called what came to be known as the Short Parliament to raise funds for the war, but he soon dissolved it when it began voicing opposition to his policies. Following the Second Bishops' War with the Scots in 1640, Charles was forced to call another parliament to raise additional funds. Defying the king, between 12 February and 20 April 1642, each county delegation of England in Commons chose two divines, in addition to two for each county of Wales, four for London, and two for each University (Oxford and Cambridge). County delegations often chose divines from their own county, but not always. Commons chose the members in this way to ensure that their local constituencies were represented in the decision. The House of Lords, Parliament's upper house, added another fourteen names on 14 May, to which Commons agreed. Meanwhile, relations continued to deteriorate between the king and Parliament. Charles raised the royal standard at Nottingham on 22 August, marking the beginning of the First English Civil War. The start of the war lent support to the cause of the Assembly in Parliament, because holding it would convince the Scots that Parliament was serious about reforming the church and induce the Scots to come to their aid. On the other hand, the war added strain to the already busy Parliament. Parliament finally passed an ordinance to hold the assembly on its own authority without Charles's assent on 12 June 1643. It named as many as 121 ministers[lower-alpha 1] and thirty non-voting parliamentary observers: twenty from Commons, and ten from the House of Lords. The Assembly was almost entirely English; Parliament appointed Englishmen for the counties of Wales, but the French stranger churches (churches of Protestant refugees from Catholic France) sent two ministers in place of any from the Channel Islands. Many of the divines were internationally recognized scholars of the Bible, ancient languages, patristics, and scholastic theology. Many were also famous preachers. Most of these theologians had retained their positions in the Church during the tenure of William Laud. Some had been ejected from their churches or cited by ecclesiastical courts for their views. Some had fled to the Continent, and one to the American colonies. Nonetheless, they all considered themselves members of the Church of England and had received episcopal ordination. Most were conformists, meaning they agreed to follow the Act of Uniformity 1558 and the Book of Common Prayer. The Assembly was strictly under the control of Parliament, and was only to debate topics which Parliament directed. Assembly members were not permitted to state their disagreements with majority opinions or share any information about the proceedings, except in writing to Parliament. Parliament chose William Twisse, an internationally respected theologian, to be the Assembly's prolocutor[lower-alpha 2] or chairman. Due to Twisse's ill health, Cornelius Burges, whom Parliament appointed as one of several assessors, served as prolocutor pro tempore for most of the Assembly. Twenty-two appointed members of the Assembly died before 1649, and they along with those who did not attend for other reasons were replaced by another nineteen members. Three non-voting scribes were also added in 1643. 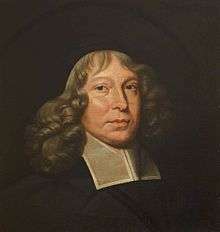 The Assembly had already done significant work on a catechism between December 1643 and January 1647 containing fifty-five questions, before it decided to create two catechisms rather than one. The Larger Catechism, intended to assist ministers in teaching the Reformed faith to their congregations. The Shorter Catechism was based on the Larger Catechism but intended for use in teaching the faith to children. Parliament demanded scripture proofs for the catechisms as well. The Scots General Assembly approved both catechisms in 1648. The divines were even more strongly opposed to Catholicism than to William Laud and his followers, the Laudians. They associated both Catholicism and Laudianism with Arminianism and persecution. Before the civil war, the divines saw these two groups as the greatest threat to the church. With the rise of radical sectarian movements during the war, the divines became much more concerned with these groups than polemics against Catholicism. The divines were particularly concerned with those they labeled antinomians. This was a loose term for those who saw the moral law as in some way no longer relevant for Christians. The divines saw these groups as more immediately threatening than Catholicism. ↑ The version of the ordinance in the Journal of the House of Lords (probably least reliable) has 119 ministers, the engrossed ordinance has 121, and early printed copies have 120. 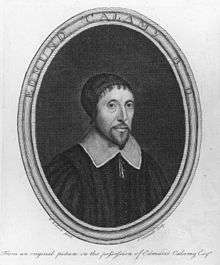 Josias Shute was included in early copies until the Lords realized he was recently deceased and replaced him with Simeon Ashe. ↑ Parliament chose this term because it was that of the leader of Convocation, the assembly of English bishops, rather than "moderator", the term used by the Scots for the leader of their General Assembly. ↑ Lee Gatiss cites Richard Muller as holding that the Confession intentionally allows for hypothetical universalist views. Jonathan Moore believes the Confession's language can be easily adopted by an hypothetical universalist, and points out that it could have been easily written to be much more clearly exclusive of such a view. J. V. Fesko argues that the Standards lean toward a particularist view, but that they do not exclude non-Amyraldian hypothetical universalist views. Robert Letham believes that the Confession at least intends to exclude hypothetical universalism, though he points out that hypothetical universalist divines were not excluded from the Assembly. A. Craig Troxel writes that the Confession excludes Amyraldism, but does not discuss the other, more moderate forms of hypothetical universalism presented at Westminster. 1 2 de Witt 1969, p. 112. 1 2 Leith 1973, p. 23. ↑ Letham 2009, p. 18–19. ↑ Leith 1973, p. 26. ↑ Paul 1985, p. 8. ↑ Paul 1985, p. 101. ↑ Letham 2009, p. 20. ↑ Fesko 2014, p. 49. ↑ Paul 1985, pp. 36–38. ↑ Holley 1979, pp. 9–10. ↑ Paul 1985, p. 3. ↑ Paul 1985, p. 56. ↑ Paul 1985, p. 58. 1 2 Van Dixhoorn 2012, p. 12. ↑ Paul 1985, p. 59. ↑ Holley 1979, p. 54, 96. ↑ Crowley 1973, p. 50; de Witt 1969, p. 15; Holley 1979, pp. 151–152. ↑ Holley 1979, p. 159. ↑ Van Dixhoorn 2012, p. 6. ↑ Letham 2009, p. 30. ↑ Van Dixhoorn 2012, p. 264. 1 2 3 4 5 6 Van Dixhoorn 2015. ↑ Letham 2009, p. 33. ↑ Van Dixhoorn 2004, pp. 83–84; Van Dixhoorn 2012, p. 14. ↑ de Witt 1969, p. 23. ↑ Crowley 1973, p. 51; Van Dixhoorn 2012, p. 9. ↑ Van Dixhoorn 2012, p. 16. ↑ Van Dixhoorn 2012, p. 170. ↑ Van Dixhoorn 2004, pp. 82–83. ↑ Van Dixhoorn 2012, p. 1. ↑ Van Dixhoorn 2012, p. 42. ↑ Paul 1985, p. 74. ↑ Crowley 1973, p. 51; de Witt 1969, pp. 32–33. ↑ Logan 1994, p. 37; Paul 1985, pp. 78, 81. ↑ Van Dixhoorn 2004, p. 88. ↑ Van Dixhoorn 2004, p. 98. ↑ Van Dixhoorn 2004, p. 104. ↑ Letham 2009, p. 40. ↑ Letham 2009, p. 41. ↑ Van Dixhoorn 2012, pp. 23, 170, 175. ↑ Paul 1985, p. 116. ↑ Van Dixhoorn 2012, p. 23. ↑ de Witt 1969, p. 62. ↑ Van Dixhoorn 2012, p. 27. 1 2 Letham 2009, p. 32. ↑ de Witt 1969, p. 25. 1 2 3 de Witt 1969, p. 27. ↑ Van Dixhoorn 2012, p. 30. ↑ Crowley 1973, pp. 54–55; de Witt 1969, pp. 25–26. 1 2 Van Dixhoorn 2012, p. 14. ↑ Barker 1994, p. 50. ↑ Paul 1985, p. 105. ↑ de Witt 1969, pp. 66–67. ↑ Paul 1985, pp. 143–145. ↑ de Witt 1969, pp. 72–73. ↑ de Witt 1969, p. 88. ↑ Paul 1985, p. 207; de Witt 1969, pp. 88–89. ↑ de Witt 1969, p. 94. ↑ Paul 1985, p. 214–215. ↑ Paul 1985, p. 276; de Witt 1969, p. 115. ↑ Letham 2010, p. 46. ↑ Yule 1974, pp. 38–39; Bradley 1982, p. 38. ↑ Bradley 1982, p. 41. ↑ Spear 2013, p. 194. ↑ Van Dixhoorn 2012, pp. 31–32. ↑ Letham 2009, p. 43; Yule 1974, p. 42. ↑ Yule 1974, pp. 39–40; de Witt 1994, p. 157. ↑ de Witt 1994, p. 158. ↑ Van Dixhoorn 2012, p. 33. ↑ de Witt 1969, p. 207; Paul 1985, p. 509. ↑ Paul 1985, p. 511. 1 2 Yule 1974, p. 43–44. 1 2 Benedict 2002, p. 402. ↑ Spear 2013, pp. 195–196. 1 2 Paul 1985, p. 518. ↑ Benedict 2002, p. 401. ↑ Van Dixhoorn 2012, p. 34; Paul 1985, p. 518. ↑ Benedict 2002, p. 401; Spear 2013, p. 196. ↑ Spear 1994, p. 259. ↑ Spear 1994, p. 266. ↑ Godfrey 1994, p. 131. ↑ Kelly 1994, pp. 110–111. ↑ Spear 2013, p. 196. ↑ de Witt 1969, p. 239. ↑ de Witt 1969, p. 241. ↑ Van Dixhoorn 2012, pp. 37, 229. ↑ Van Dixhoorn 2012, p. 38. ↑ Letham 2009, p. 83. ↑ Letham 2009, pp. 85–86. ↑ Leith 1973, pp. 38–39. ↑ Letham 2009, pp. 94–95. ↑ Fesko 2014, p. 69. ↑ Fesko 2014, p. 71. ↑ Muller 2003a, p. 152; Letham 2009, pp. 121–122. ↑ Leith 1973, p. 77. ↑ Letham 2009, p. 133. ↑ Leith 1973, pp. 82–89. ↑ Letham 2009, p. 176. ↑ Moore 2011, p. 123. 1 2 Moore 2011, p. 148. ↑ Letham 2009, p. 177. ↑ Moore 2011, p. 151. ↑ Fesko 2014, p. 202. ↑ Letham 2009, p. 182. ↑ Troxel 1996, pp. 43–55; Gatiss 2010, p. 194. ↑ Leith 1973, pp. 91–92. ↑ Letham 2009, p. 226. ↑ Jones 2011, p. 185. ↑ Van Dixhoorn 2001, p. 111. ↑ Van Dixhoorn 2001, p. 112. ↑ Van Dixhoorn 2009, p. 403. ↑ Van Dixhoorn 2009, p. 415. 1 2 Benedict 2002, pp. 402, 404. ↑ Keeble 2014, p. 17–18. ↑ Keeble 2014, p. 20. ↑ Keeble 2014, p. 25. ↑ Hudson 1955, pp. 32–33. ↑ Spear 2013, pp. 196–197. ↑ Bradbury 2013, p. 66. ↑ Spear 1993, p. 76. ↑ Rogers 1985, p. 140. ↑ Bremmer 2008, p. 158. ↑ Rogers 1985, pp. 140–141. Barker, William S. (1994). "The Men and Parties of the Assembly". In Carlson, John L.; Hall, David W. To Glorify and Enjoy God: A Commemoration of the 350th Anniversary of the Westminster Assembly. Edinburgh: Banner of Truth Trust. ISBN 978-0-85151-668-4. Bremmer, Francis J. (2008). "The Puritan experiment in New England, 1630–60". In Coffey, John; Lim, Paul C. H. The Cambridge Companion to Puritanism. ISBN 978-0-521-67800-1. Godfrey, W. Robert (1994). "The Westminster Larger Catechism". In Carlson, John L.; Hall, David W. To Glorify and Enjoy God: A Commemoration of the 350th Anniversary of the Westminster Assembly. Edinburgh: Banner of Truth Trust. ISBN 978-0-85151-668-4. Jones, Mark (2011). "The 'Old' Covenant". In Haykin, Michael A.G.; Jones, Mark. Drawn Into Controversie: Reformed Theological Diversity and Debates Within Seventeenth-Century British Puritanism (PDF). Göttingen, Germany: Vandenhoeck & Ruprecht. ISBN 978-3-525-56945-0. Keeble, N. H. (2014). "Introduction: Attempting Uniformity". In Keeble, N. H. 'Settling the Peace of the Church': 1662 Revisited. Oxford: Oxford University Press – via Oxford Scholarship Online. (subscription required (help)). Kelly, Douglas F. (1994). "The Westminster Shorter Catechism". In Carlson, John L.; Hall, David W. To Glorify and Enjoy God: A Commemoration of the 350th Anniversary of the Westminster Assembly. Edinburgh: Banner of Truth Trust. ISBN 978-0-85151-668-4. —————— (2010). "Catholicity Global and Historical: Constantinople, Westminster, and the Church in the Twenty-First Century" (PDF). Westminster Theological Journal. 72: 43–57. Logan, Samuel T., Jr. (1994). "The Context and Work of the Assembly". In Carlson, John L.; Hall, David W. To Glorify and Enjoy God: A Commemoration of the 350th Anniversary of the Westminster Assembly. Edinburgh: Banner of Truth Trust. ISBN 978-0-85151-668-4. Moore, Jonathan D. (2011). "The Extent of the Atonement: English Hypothetical Universalism versus Particular Redemption". In Haykin, Michael A.G.; Jones, Mark. Drawn Into Controversie: Reformed Theological Diversity and Debates Within Seventeenth-Century British Puritanism (PDF). Göttingen, Germany: Vandenhoeck & Ruprecht. ISBN 978-3-525-56945-0. Muller, Richard A. (2003a). After Calvin: Studies in the Development of a Theological Tradition. New York: Oxford University Press. doi:10.1093/acprof:oso/9780195157017.001.0001. ISBN 978-0-19-515701-7 – via Oxford Scholarship Online. (subscription required (help)). ———————— (1994). "The Unfinished Westminster Catechism". In Carlson, John L.; Hall, David W. To Glorify and Enjoy God: A Commemoration of the 350th Anniversary of the Westminster Assembly. Edinburgh: Banner of Truth Trust. ISBN 978-0-85151-668-4. ————————— (1994). "The Form of Church Government". In Carlson, John L.; Hall, David W. To Glorify and Enjoy God: A Commemoration of the 350th Anniversary of the Westminster Assembly. Edinburgh: Banner of Truth Trust. ISBN 978-0-85151-668-4. Yule, George (May–August 1974). "English Presbyterianism and the Westminster Assembly". The Reformed Theological Review. 33 (2): 33–44. 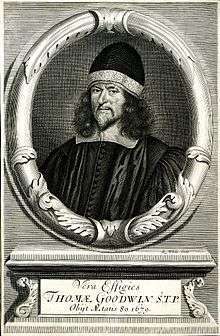 Baillie, Robert (1841) [1642–1646]. Laing, David, ed. The Letters and Journals of Robert Baillie. 2. Edinburgh: Alex Lawrie & Co.
—————— (1841) [1647–1662]. Laing, David, ed. The Letters and Journals of Robert Baillie. 3. Edinburgh: Alex Lawrie & Co.
Hetherington, William Maxwell (2010-07-20) . History of the Westminster Assembly of Divines. Centre for Reformed Theology & Apologetics. Letham, Robert (2015). "The Westminster Assembly and the Communion of the Saints". In Balserak, Jon; Snoddy, Richard. Learning from the Past: Essays on Reception, Catholicity, and Dialogue in Honour of Anthony N. S. Lane. Bloomsbury. ISBN 978-0-567-66090-9.